Consider hardwood flooring when renovating any room of your home for its beauty, ease of maintenance, and its durability. Shopping for engineered or solid hardwood flooring is made easy at our showroom. We’re proud to boast a wide selection of options, including different species, colors, finishes, and grains. Our knowledgeable sales staff is happy to listen to the specific requirements of your construction or renovation project and make recommendations accordingly. All aspects of your project are taken into consideration, including your design preferences, performance expectations, and your budget. When you need a reliable hardwood flooring installation, come visit our showroom, where we always have low-cost prices on high-quality products. Solid hardwood flooring adds a timeless look to any home, and it’s capable of outlasting the lifespan of your home. Solid hardwood benefits from natural, beautiful features. As it inevitably ages and becomes scratched, it can simply be refinished to restore its original look or to create a completely new aesthetic. Whether your style is rustic, contemporary, traditional, modern, craftsman, bungalow, or Victorian, this flooring complements any style. Deciding to have solid wood floors installed your home will surely increase its value. Potential home buyers are much more willing to buy a home if it has hardwood. On top of retaining its natural beauty, this type of flooring is also easy to clean, maintain, and upkeep. Put your worries to rest as there’s no intense cleaning routine. Dirt, dust, and grime are taken care of with a broom and a mop! Hardwood is also great if you or anyone in your family have allergy problems. Try hardwood floors for a cleaner environment. Solid hardwood is sturdy flooring that will last for many years, offering you a great return on value. It’s a strong material, and it is wonderful for high-traffic areas, making it perfect for just about any room throughout your home. Help your flooring last even longer by taking proper care of it now. Follow the manufacturer's cleaning recommendations and enjoy it for decades to come. Give your home an immediate upgrade by adding engineered wood flooring. These floors may be for you if you enjoy a more luxurious look, but at a less expensive price. They are as stunning as they are practical, so there’s nothing to sacrifice in style. Choosing this material supports the green movement as an eco-friendly option and it never goes out of style. Popular for its many advantageous characteristics, many homeowners opt for this handsome flooring because it works well with any type of decorating. Whether you want hardwood floors in your living room, kitchen, or even bathrooms, the composition of engineered hardwood offers unique advantages over other flooring materials. While the top layer is indeed real wood, the base layer is comprised of high-density fiberboard (HDF). HDF is denser and less porous than natural wood, giving it enhanced rigidity and increased moisture resistance. Maintenance is a breeze, it will last for years, and it makes for a solid investment in your property. Always a popular choice, distressed hardwood floors look great no matter what grain or color you pick. It looks amazing with virtually any type of design in the home. Its worn-out look elicits memories of everything from classic estates, to Midwestern farm houses, and even European castles. The natural grooves, knots, and colors remain contemporary, and produce a beautiful finish to be cherished for years to come. Even as these floors endure heavy foot traffic, its qualities only become more refined. Pick from a diverse selection of wood choices and grains to outfit your home at our showroom. Whether you prefer darker hues or lighter hues, our extensive stock contains something for everyone. We’ll help you find something that suits your needs and your budget. 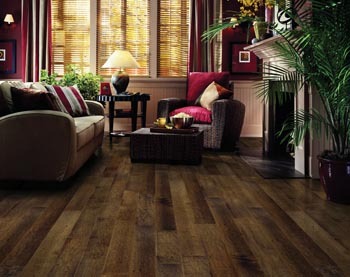 Hardwood floors add value to any home as well as a wonderful sense character. It’s a big investment, so you’re going to want to back your purchase with quality installation service. Allow our professionals to get your installation right the first time. Hardwood flooring installation in Longmont doesn’t have to cost an arm and a leg, as we offer the best installation rates in town. Your complete satisfaction is our number-one priority. Our pledge is “To provide you with a level of personalized service that is matched by any home improvement center or other flooring store – and to do everything in our power to earn your trust, business, and recommendation to your friends.” Expect high-quality in everything, from the inception of the project to the satisfactory completion.